Kickstarter kings Pebble have launched their latest and greatest e-paper smartwatch, the Pebble Time with orders already going through the roof on the pledge site. Featuring an always-on, colour e-paper display, the Pebble Time promises the same 5 to 7-day battery life of their earlier monochrome Pebble and Pebble Steel watches. Sporting a stainless steel bezel and scratch-resistant Gorilla Glass screen, the new smartwatch is 20 percent thinner than its predecessor at 9.5mm and boasts an intriguing “smart accessory port” letting developers build sensors and bands that interact directly with the watch. The watch comes with a new microphone which lets users send voice replies to incoming notifications or take short voice notes. Pebble Time is compatible with Android and iOS devices and is available now for $159 in three colours exclusively on Kickstarter. Shipping is set to begin in May of this year. After the campaign, Pebble Time will sell online and in stores for $199. The project has already smashed through its $500,000 goal, with nearly $4 pledged at the time we went to press. Palo Alto, CA (February 24, 2015) — Pebble Technology Corp., the smartwatch pioneer and a Kickstarter record holder, is proud to launch its brand new watch, Pebble Time, on the same community-driven platform that helped them introduce smartwatches to the entire world three years ago. Everything about Pebble Time — from its new technology to the reimagined software interface — was meticulously designed to mesh perfectly with your life. Starting today, anyone can back Pebble Time on Kickstarter at http://pbl.io/kickstarter. Pebble Time features a revolutionary new color e-paper display that provides a stellar visual experience, always-on timekeeping and brilliant outdoor visibility. Compared with display technology like LCD or OLED, power consumption is minimized, enabling Pebble Time to achieve an industry-leading battery life of up to 7 days. Pebble Time introduces a new microphone, allowing you to send voice replies to incoming notifications or compose short voice notes. Using the latest technology, water resistance is maintained, so you can swim, shower and surf with Pebble Time. 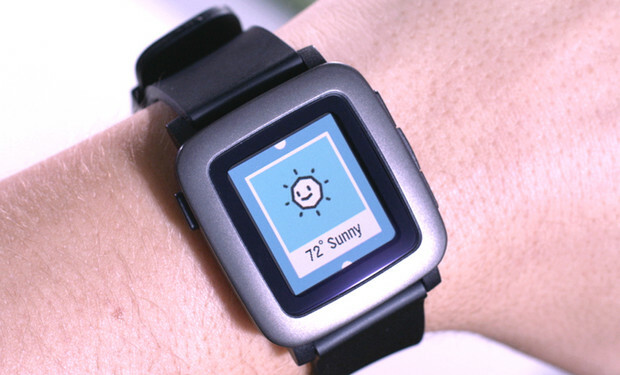 Pebble Time is 20% thinner than the original Pebble, with an ergonomic, curved design that’s comfortable on any wrist. The lens is crafted from scratch-resistant Gorilla Glass and the bezel is made of stainless steel. The watch band incorporates a quick-release mechanism, making it easier than ever to personalize your watch. Pebble Time also has a smart accessory port, enabling hardware developers to build sensors and smart straps that connect directly to the watch. Like other Pebble watches, Pebble Time is designed to work perfectly with both iPhone and Android smartphones. Pebble Time is compatible with iPhone 4s and newer phones running the latest version of iOS 8. Pebble Time works with all Android 4.0+ phones including Samsung, HTC, Song, LG, Google, Motorola, Xiaomi and more. Building a modern timepiece requires focus on software as much as hardware. Pebble Time introduces a new version of Pebble operating system (OS) that organizes relevant information like notifications, weather, news, travel, and reminders chronologically. With one click you can see what’s coming up next, such as a reminder to pick up your kids or when a movie starts. Pebble Time also helps when you need to catch up on things that happened in the past. You can scroll back to see an email you missed, your step count for the day, or the score from the game last night. Now, instead of opening an app just to see the weather, or to check the market, you can reliably get the details you need at a glance. Pebble Time is fully compatible with all 6,500+ existing Pebble apps and watchfaces, surfaces information at the moment it’s most useful, and enables quick action. Pebble is working with The Weather Channel, ESPN, Jawbone, Evernote, Pandora and others to build unique experiences for the new OS and more partners will be announced soon. As with all Pebble software, Pebble Time is built on an open platform, and introduces many new APIs and tools for developers. Pebble Time is available in three colors for $159 exclusively on Kickstarter, with worldwide shipping to backers starting in May. Later this year, Pebble Time will retail for $199 and be available online at getpebble.com and in stores worldwide.